8 Longboat ~ Multi Level, 5BR Ocean Front Home with Two Master Suites! 8 Long Boat is a gorgeous 5 bedroom, 4 full & 2-half bath oceanfront home on 4 levels offering beautiful panoramic views of the Atlantic Ocean. This home is ideal for large gatherings. The living room has large windows, vaulted ceilings, a 42 inch flat screen HDTV and two entries to the tiered deck leading out to the pool. The fully-equipped eat-in kitchen has two sinks and a connected laundry/mud room with a half bath. Both master suites have a balcony with large master baths and jetted tubs. The fourth level has a loft with a Twin with Trundle and a private balcony looking out to the ocean. 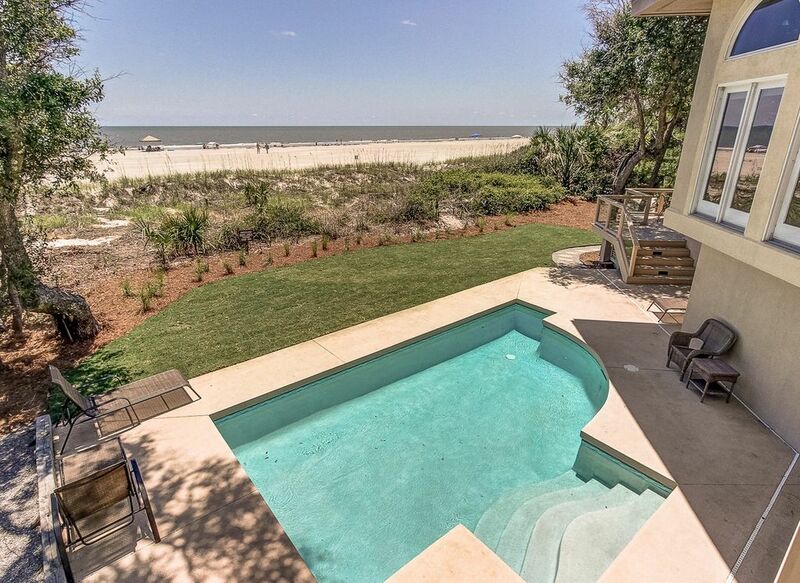 This one-of-a-kind home, just steps from the beach walk, is located in the award winning Palmetto Dunes Resort. Enjoyed the week of rest.. The house was Great and right on the beach but it needs a lot of fixing up..Needs painting especially the inside. Outside could use it also. One of the upstairs bedrooms could not get the TV to work. The carpet needs replacing as is dirty and smells. A lot of paint pealing and some rust in some metal hinges. It sure is not for a handicapped person for all the stairs and low profile toilets. Too expensive for my thinking. Had a great time. Property was great!! Air would be nice! In JUNE!! We have been here since Saturday with no A/C in half the house!! Including a master bedroom! The management has done nothing to fix the issue and it's Wednesday!! Book elsewhere! This is is unacceptable! All you get from management is excuses! And also the pool was filthy when we checked in on Saturday and they assured us it would be clean by Sunday. It was Monday. Please call or send email inquiry for stays longer than one week. Online quotes do NOT calculate correctly for longer term rentals or stays that overlap two different rate periods. Pet Friendly September - May ONLY! Monthly rentals are four full weeks, Saturday - Saturday. Call for Specials and Hot Deals. Mention you saw it on VRBO.